I bought you mail order, my plain wrapper baby. Your skin is like vinyl, the perfect companion. You're the 107th most acclaimed album of all time. 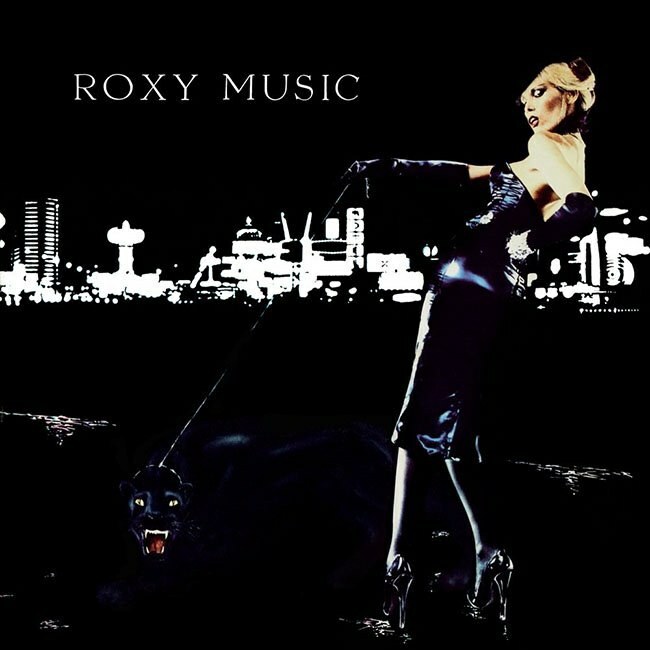 Roxy Music's 1973 classic is this week's Counterbalance. Mendelsohn: I'm completely confused by Roxy Music's For Your Pleasure. I'm unsure how to work it in to my musical narrative, let alone placing it contextually in the canon of great albums, so I'm just going to work it out as we go. From the outset, this album seems a little off-kilter and yet so progressive and forward-thinking that it sounds a full decade ahead of its time. There are so many opposing forces working in the music that it's hard to believe the band could make a coherent whole, and that strange dichotomy seems to be personified in the presence of Roxy's dapper frontman Bryan Ferry and the flamboyant, oddball Brian Eno. This record is strange and wonderful. I'm left wondering why I hadn't given it much of a chance until now but I can't help thinking that a certain amount of patience and appreciation for the forebears of the punk and glam standard would first have to be cultivated. In my younger days, I don't think I would have made it past the first couple of bars of "Do the Strand" and that would have precluded me from finding the scary genius of "In Every Dream Home a Heartache", the epic grandeur of "Strictly Confidential", or the sly funk of "The Bogus Man". My only question is, where did this album come from? Looking back to the early 1970s British rock scene, you have a rather large power vacuum created by the absence of the Beatles now slowly being filled in by the likes of David Bowie and Pink Floyd. To my ears, Roxy Music is more in line with the glam that Bowie was proffering than the bluesy space funk from Pink Floyd. Even so, For Your Pleasure seems like such a non sequitur in comparison to Dark Side of the Moon or The Rise and Fall of Ziggy Stardust and the Spiders from Mars. Or are we looking at a music supernova—an odd mix of both—where the rambling, explorative space funk ran headlong into the bright lights and glitter of the glam ethos? Klinger: Well, it certainly seems that there are two distinct forces at work here, between the grit and glitz of glam and the more esoteric soundscaping of what critics used to call "art rock". And you're right, in one sense For Your Pleasure seems very rooted in its time, and yet it also sounds very much like something we could call the headwaters of New Wave. I've always heard a distinctly retro sensibility in glam, although sometimes it's hard to put my ear-fingers on exactly what I'm hearing that puts me in that mind. Still, I suspect it's very much there, from Mott the Hoople's "All the Way from Memphis" right up to Bryan Ferry's modified quiff. There are flavors of that all the way through For Your Pleasure as well, especially when Andy Mackay's saxophonery heads down into the honking range, like it does on "Do the Strand". That feeling never lasts too awfully long on this album, though, as the mood usually shifts pretty abruptly into something decidedly more forward-thinking. I notice it most in "Strictly Confidential", where the big open chords of the chorus keep morphing into something somewhat otherworldly (and as Andy Mackay switches from tenor to soprano sax or even oboe). By many accounts, we have Brian Eno to thank for much of that experimentation, but it's also a function of several highly skilled musicians given the space to breathe with sympathetic arrangements and production. Mendelsohn: This album is indeed somewhat of a showcase, not only for the competing sectors of art rock and glam but for some very talented musicians. The greatest example of that may be in "Grey Lagoons", a song that starts off as piano-driven pop as a bedrock for Ferry's warbling croon before it transmutes into a glam sax breakdown courtesy of MacKay, followed by quite possibly the best use of harmonica I've ever heard—the competing solos that Ferry strings together are simply amazing—and then we are treated to some of the glam roots you spoke of earlier, with a shedding guitar over a rootsy, rockabilly piano work out before the song drops back into the rollicking pop groove. I didn't expect any of that, and the first time I made it through the album I wasn't sure what I had just heard. Looking for this record it's easy to spot the elements that would turn into New Wave over the next decade—Roxy Music's influence is spread over the music scene of the late ’70s and early ’80s like so much Nutella over toast. But for a band that had so much influence, and so much talent, I never really saw too many bands past the mid-1980s reaching back to Roxy Music for inspiration. Did they become lost in the breaking crest of New Wave or am I just not familiar enough with the band to recognize the genetic material that has survived over the following decades? Klinger: I'd say it's entirely likely that many American listeners just never made the connection. I know that my initial experience with the group only made it as far as occasional airings of "Avalon" and "More Than This" during the early days of MTV and maybe the odd appearance of "Love Is the Drug" on the radio (or am I imagining that?). Overseas, their name was a good bit better known, even if they were occasionally lumped in with the rest of the glam movement. Mendelsohn: So it seems that my lack of knowledge concerning Roxy Music doesn't stem from my laziness; rather, it arises out of my cultural upbringing of not being British. Good to know. As we've made our way through the Great List, we've encountered that disconnect many times to varying degrees. It is well-documented that the list is made up of mostly American and British recording artists, but I'm always surprised by how much difference there is in reaction to a record depending on what side of the pond you find yourself on. Do you think, due to the UK's musical upbringing with pastoral folk and heavy doses of whimsy—as opposed to the blues and cynicism of American rock 'n' roll—that our British counterparts are more open to the glam and grandeur of Roxy Music? Did it just miss the mark for American listeners? Klinger: Something tells me that American rock audience (and that likely includes critics of the time) were a little too hung up to really get behind the suave sybaritic sounds of Roxy Music. It couldn't have helped that the band was often dressed like a bizarre hybrid of The Rocky Horror Show and Sha Na Na (we prefer our androgyny to be a little earthier—you know, more like Mick Jagger or Robert Plant). Nevertheless, Roxy's sound clearly did make its way into our consciousness, albeit gradually, in the artsier New York scene half a decade later. In his masterful defense of Roxy Music, critic Tim DeLisle even points to Chic adopting Bryan Ferry and company's bespoke sophistication. I hear their musical harkening back to eras past in Blondie's amalgamation of pre-Beatle pop and herky-jerky rhythms. Sadly, no one appears to have used "In Every Dream Home a Heartache" to bring to life a musical subgenre related to blow-up dolls, but there's always time. And I know I've said it before, but ultimately this is one of the real benefits of rock criticism in general and big crazy lists like this one. For every time we find ourselves bemoaning the hegemony of another Dylan album or another Stones album, there's a chance we'll come across something like this that has the potential to make someone dig in a little bit deeper and discover something new. I like to think that one of those people will be some teenage kids somewhere, and they might use these charts to navigate their way through the music—and maybe come up with a new classic all their own.